Expanding the previous post’s dimensions a tad, these slimline garden sheds comprise 3-4 ft depths, twin door access across their frontage and span 7-8 feet wide meanwhile embody comparable weather-resistant fascias. Uniting the essential ingredient of resin to combat decay, either polyethylene or polypropylene is manufactured into multi-layered panels to enhance sturdiness to the shed’s construction besides providing endurance to withstand deterioration enforced upon by the invasion of weather forces. Exercising judgement regarding the ‘best of the crop’ is purely down to personal preferences in choosing a style & budget that suits both the pocket & garden surroundings however I’m sure you’ll agree with the exhibits shown below, there’s some smart creations parading elegant presentations. UV stabilised resin survives 4-season weather aggression, enduring ice, rain, heat & damp environments without any alteration to the composition. A quick freshen up with a garden shower-hose constitutes their occasional clean, epitomising how convenient maintenance has become compared to the formalities of traditional conserving. As a prerequisite to constructing these slimline storehouses, it’s imperative they station level, above a floodplain and on solid ground, as their images portray. Typical foundations comprise concrete, asphalt, paving, wood decking or tarmac etc. It’s worth noting: all sheds will leak if immersed in flood water; best to raise the foundations if in doubt. The Alpine constitutes a smart & elegantly stylish storage solution designed by Suncast. Extending 7½ feet across the door-face and 3½ feet deep provides slender dimensions, tailored for positioning with its back against a house wall supplementary to anchoring. Simulating exquisite wood panel styling further to exhibiting the calm tones of a sandy coloured surround centred with chocolate twin doors and a crest impersonating slate-roof tiling captivates eye-appeal. Multiple panels layered together through a process termed blow molding delivers ‘across the board’ rigidity whilst up in the roof rafters, a centred steel ridge beam under-girds the roof-sheets bolstering auxiliary support for winter’s snowfall. An effective aslant roof pitch surmounts the Alpine for drainage, jutting out a degree beyond the walls escapes rainwater leaks inside meantime the steepness returns towering internal measurements exceeding 8 feet, ideal for storing lengthy equipment & gardening tools. Dual air vents positioned on opposite sides combat saturation by generating a continuous fresh internal ambience, a reinforced heavyset polypropylene floor encases the shed from the elements by interlocking with the fascia whilst extensive access opens up courtesy of two strapping double doors. The only negative regards fitting the door windows during assembly, they sound rather a pain. Nonetheless, 4 metal hinges per door describes the quality of operation Suncast strive for, accompanying their internal latching mechanisms and lockable handles, displaying a traditional twist. 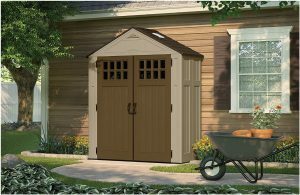 Cascade’s 7 x 4 feet shed flaunts the most charming two-tone shades of vanilla walls & stony doors, expressed within these scenic images. Showcasing this picturesque architecture makes the Cascade ideal for settling in close proximity to the outlook from a home’s window or favourably stationed on the outskirts of a patio. Cascades fascia shell is composed of recyclable polypropylene together with the addition of UV protection to ascertain weather-resistance. The multi-layered fascia panels are produced by blow molding whereby the mirror image of a wood alike construction is simultaneously created. Imitating the realistic guise of roof tiling, Suncast’s innovative manufacturing procedure additionally armours the crown with rot-resistant polypropylene providing guarded defence to endure the stresses of nature whilst the steep incline from the vertex assures rainfall drains off the instant it drops. The steepness of the roof reciprocates a high ceiling inside, providing a tall space for accommodating lengthy tools. Exploiting the loftiness by installing free-standing shelves solves the solution for storing hefty storage off the floor. Outside freshness generates through front & back ventilation grids, eliminating the development of stale sweaty atmospheres & dripping walls in humid environments. A strengthened floor panel subsists weighty storage tensions meanwhile creates a blockade from debris, leaves & critters by interlocking with the fascia panels. Square arching door windows brighten the interior with natural light whilst the double doors incorporate high grade fittings. Metal hinges improve door swings, internal latches effectuate a left-hand door stop to counteract windy weather meanwhile traditional handles comprising a though-bolt & padlock clasp attain closure & security. 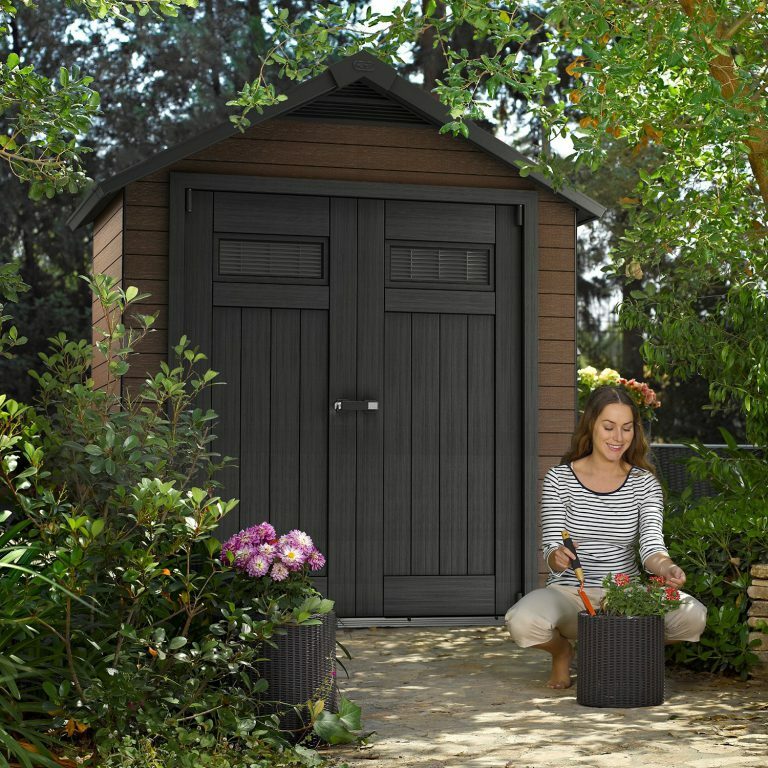 You may have noticed the new-styles of composite decking boards, replacing the arduous task of wood preserving with the leisurely operation of a pressure-wash.
Fusion sheds have recently stepped on-board, designing the first composite garden sheds range. Comprising 3 sizes stretching up to 9 feet long, they combine UV stabilised polypropylene with wood delivering the rich aspect of tradition with the potency of durable decay-resistant resin. This Fusion spans 7½ feet wide by 4 feet deep, exhibiting traditional eye-appeal to enrich any home-yard setting whilst the slender depth situates in narrow & restricted locations. Fusions receive first-rate feedback for style, virtually maintenance-free, robust construction and superior features meanwhile a clear-cut assembly approach swiftly constructs due to their tongue & groove panel boards straightforwardly aligning plumb. The apex is branded as ultra strong, able to accommodate 100 kg /sqm snow-loads meanwhile the roof make-up comprises a UV stabilised, recyclable & impermeable polypropylene manufacture, artistically simulating a 3D impression of slate tiling, resulting in a stylish imperishable rooftop overlapping the walls. You can chuck away those old wood-stain varnish tins, Fusions don’t require any nurturing nor conserving. A pressured hosepipe shower whilst using the occasional soft brush to remove moss constitutes the cleaning operation that soon revives the rich wooden tones; sure beats traditional frustrations. Opposite facing ventilation grids combat clamminess by creating an air-stream of freshness to circulate Fusion’s interior. A light & airy atmosphere is created by the skylight & door windows basking natural light whilst the steep roof pitch returns lofty headroom height for accommodating gardening tools & extendable ladders. 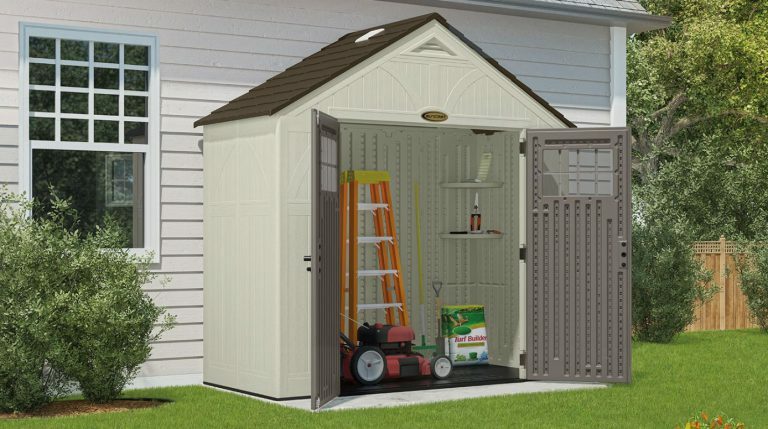 The floor encases the shed by interlocking with the composite panels to attain a dry & debris-free interior meanwhile substantial toughening aids to endure hefty storage movements, like parking the lawnmower. On account of the walls comprising wood, they’re screw-able, enabling hooks to be fitted for hanging gardening tools against the walls. 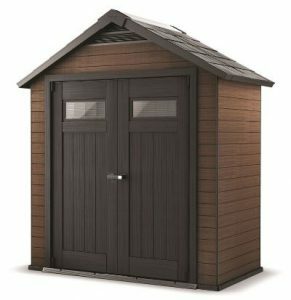 Tremont’s 8 x 4 feet proportions top this selection off in terms of offering extensive slimline sheltered accommodation for gardening tools, sporting equipment, toys and out of home accessories. This model is deceptively spacious. Measuring our locally purchased free-standing DIY shelves, their 3 ft length by 1½ ft depth provides an ideal spread to situate length-ways either side of the double doors whereas alternatively a couple stood across the shed’s breadth still delivers adequate room in-front for occupying additional storage. Half the shed couldn be used to accommodate this kind of shelving leaving the other half for long-handled tools and equipment. Potential regarding Tremont’s accommodation space is quite varied, especially making use of the 8 ft ceiling height towards the apex ridge. Included accessories comprise 2 corner shelves with 8 possible locations where to install, shown in the image below. Suncast’s cutting-edge blow-molding technique simulates ornate wooden styling embossed with realistic textured grain. A vanilla shade modishly integrates with stony doors, harmonising neutral tones to champion the vicinity of most garden plots. Manufactured from reinforced durable rot-resistant polypropylene entails a snip of a cleaning operation whilst the molding procedure creates twin-lined sheets of resin to intensify the composition. Tremont’s substantial construction puts an end to forthcoming dents emerging and subsequent roof replacements. Two skylights implanted within the roof team up with the door windows to emit daylight, a built-in floor panel keeps storage off the ground & clean whist fresh ventilation is distributed by a couple of facing grids incorporated at the top of the apex peak. Two burly double doors function their swing courtesy of 3 metal hinges whilst traditional handles, a through-bolt & padlock catch perform locking-up. The video below demonstrates Tremont’s impressive features. Prefer a slightly slimmer design? Hope we’ve provided plenty of creative thoughts for your narrow placements. 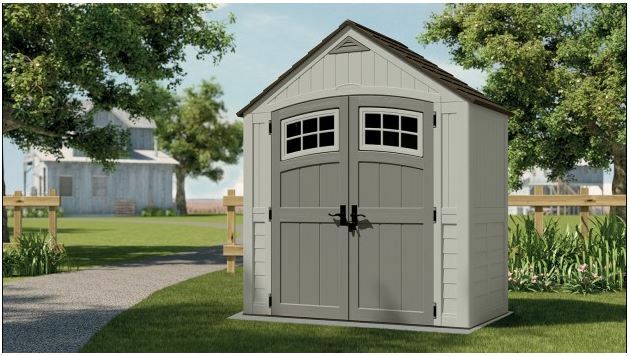 Share your favourite slimline weatherproof shed below along with any relevant questions. Please share these slimline garden sheds. Thank you. 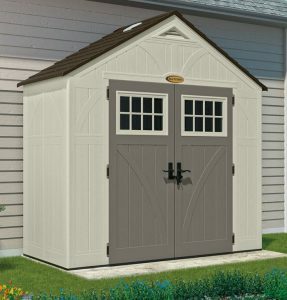 I’ve been looking for a new shed now that we moved to our new place…which just happens to be on the coast. So, no metal sheds for us. It has to be plastic. I was surprised to see so many options available in plastic. And that you can get so many color options to match the house!!! Fantastic! 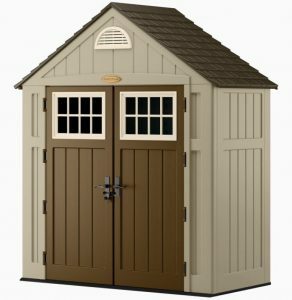 In general, are these plastic sheds a lot easier to assemble than their metal counterparts? I sure would think so! Hi kmv, thanks for calling in to explore the current selection of slimline sheds encased in a weatherproof resin manufacture. Salty air on the coast can cause havoc to metal constructions with regards to corrosion. Although many are coated with similarities to a polyester finish to protect against the onslaught of rust, you only require a scratch through to the metal for the corrosion process to start; once it takes hold, it rapidly expands. There are quite a few colour options available to match many house shades but the only resin manufacture I have come across that caters for painting regards Duotech storage solutions whereby they amalgamate resin talc into polypropylene, resulting in a composition that adheres to acrylic emulsion, thereby provides the opportunity to match any colour scheme. The only issue with painting a resin manufacture is they will require re-coating. Overtime, sunburn fades paint colours however you won’t be confined to sorting rotting panels before decorating, a mere wash & dry prior to commencing is all that’s needed. The main priority for a plastic shed concerns stationing them on solid level foundations to accomplish a plumb standing shed that functions precise door swings however you’ll find assembling from a level base streamlines installation due to the fascia panels easy alignment prior to securing therefore my guess is they’re easier to construct than metal sheds if you conform to the foundation stipulations. 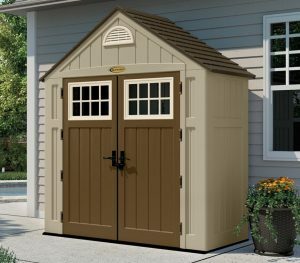 I would surmise the Fusion 7.5 x 4 ft shed up above is the easiest to construct on account of the panels tongue & groove formation. You simply connect the panels together & slide into position to align which eases the build process dramatically. 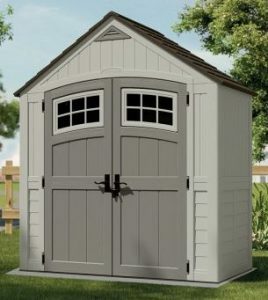 Thanks for calling in to read about these various slimline garden sheds. Their most popular stance and position is to stand against a house wall, you are right. Although it’s recommended to anchor them down into the substrate below, wind resistance-wise and situated this way will increase stability many times. 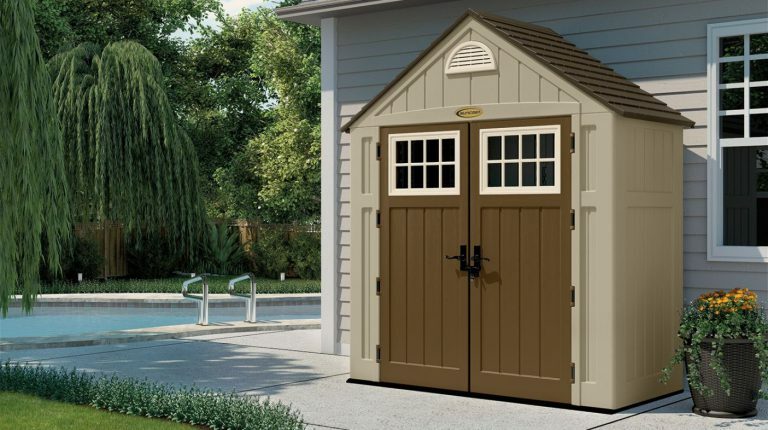 This style of shed suits where space is rather tight like down the side of a house or positioned on a patio plot however many people are restricted in size due to planning laws nowadays, especially over in America. 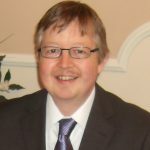 The UK isn’t as bad as some of the states in the USA. A perfectly level concrete slab is the best way to go, making sure the shed won’t be stood in a floodplain, it’s a good idea to raise the foundations if there are doubts. No matter what type of composition is preferred they will all leak if immersed, wood, metal and resin. 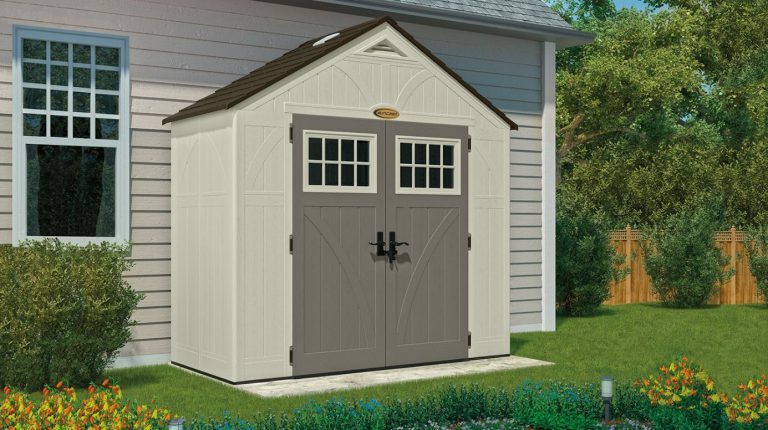 Shed Sizes shows all the low maintenance plastic sheds reviewed on this website arranged in order of size, scroll down to your preferred dimensions and link to read their reviews. Hope you find plenty of inspiration for garden storage ideas.